This is a simple recipe including garlic, onion, and your favorite hair oil. Garlic and onion have good nutrients that aid the hair to grow. Garlic For Hair: Garlic contains essential nutrients such as sulfur, vitamin c, selenium, and copper. The nutrients are beneficial for hair growth. The copper in the garlic helps the hair to grow, thicken, and boost your natural hair color. The selenium in the garlic helps to stimulate blood circulation for maximum nourishment. Onion For Hair: Onion is enriched with high sulfur content. This rich sulfur content in onion will help your hair against thinning and breakage. 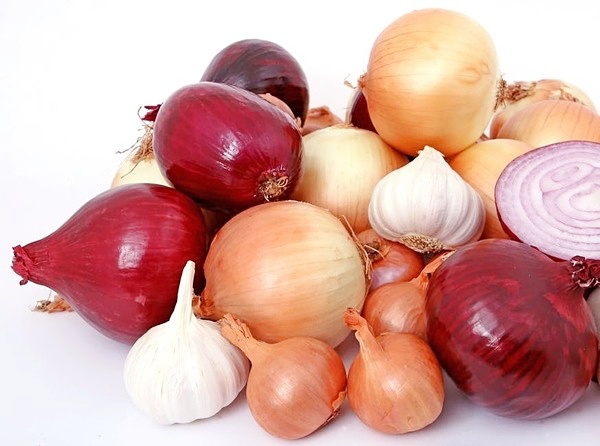 Onion is rich in antibacterial properties, therefore, helping your scalp to stay healthy. Follow this simple recipe for garlic/onion oil. 1. Put onion and garlic in a blender and blend until smooth. 2. Heat your desired choice of oil, and then add the onion and garlic blend to the hot oil. 3. Occasionally stir the garlic and onion blend in the oil until the mixture turns brown. Turn off the heat. 4. Once the mixture is cooled down, drain the onion/garlic infused oil blend through a cheesecloth. Keep the infused oil and discard the onion/garlic blend. 5. Take a tablespoon or two of the infused oil and gently massage the oil into your scalp for about 15-20 minutes. You can use your fingertips or a scalp massage. After massaging your scalp, coat the rest of your hair with the oil. 6. After the massage, cover your hair with a shower cap and allow your body heat to work your hair. Cover your hair for 30 minutes. 7. After 30 minutes, wash and style your hair as usual. **Do this hair treatment about 2-3 times a week for excellent results. Do you use any special oils for hair growth?